This famous declaration by the British author applies to all creative pursuits, I think. Since I work full-time and pursue writing in my off-hours, the money’s not an issue. * Time is; I handle that by getting up at 5 a.m. I assume there’s a better solution but a wealthy patron has yet to step forward. That leaves the room. I’ve sought a dedicated space of my own for years, simply because writing requires listening to your inner monologue. I find this impossible to do in my family room, when ESPN’s on, the dog’s barking, and someone needs advice on an essay topic. So I finally decided to take advantage of the only perk I’ve found to my nearly empty nest – liberated floor space. I appropriated one of my kid’s bedrooms and transformed it into my lady’s lair. I picked the Schumacher wallpaper first and used it as my inspiration for color and mood. Once I decided where to put a desk, I had my electrician install two pendants above the space to give me plenty of task lighting. Clicking through Joss and Main one day, I fell in love with the clean lines of the mid-century modern desk in natural cherry which just happens to be my favorite wood finish. I try to keep the clutter to a minimum by hiding what I can in the closet and pinning inspirational articles and photos on the bulletin board. One of my favorite items in the room is the plastic tote I use for a garbage can; I carry it down to the basement for shredding about once a week. On the other side of the room, I stationed a Crate and Barrel sleeper chair and a half, for the return visits from the chicken who’s flown the coop. 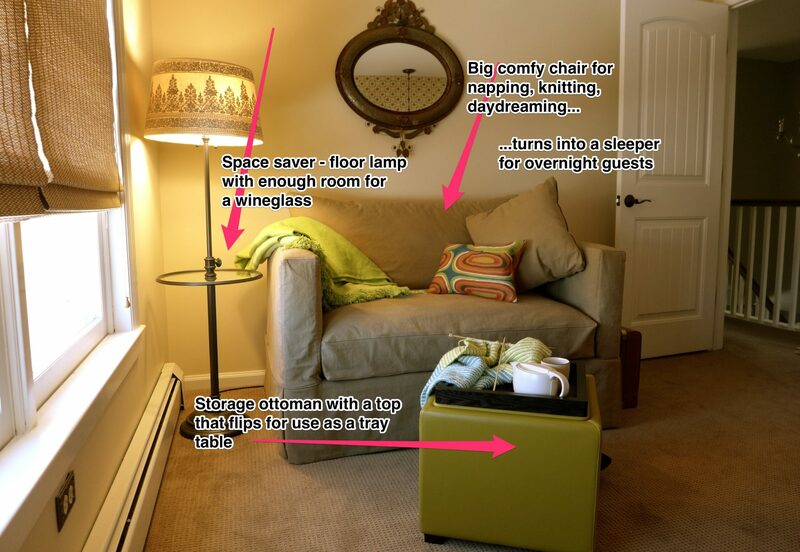 My grandmother had a floor lamp like this one back in the day; it’s a perfect spacesaver, as is the ottoman that doubles as a coffee table and triples as a storage unit – also from C&B. I chose unlined woven shades. I love the way they filter the daylight and I think they provide enough privacy when the room’s used by guests – the neighbors have not told me otherwise. And, the room has a door. I have yet to invoke “Do Not Disturb”, but it’s nice to know it’s an option. What a great room! Thanks for sharing ~ I’ve been inspired to create a room (space) of my own. Thank you! Good luck with your project. Keep me posted. So cute! Love the wallpaper. Thanks! I am palette-challenged, so I tend to use wallpaper or fabric to help with color choices. I admire artists like you who can throw stuff together and, in the words of Tim Gunn, make it work! Smart way to make a colour decision! You did really well – I don’t think you’re as palette challenged as you may think. And thanks for following! You’re very welcome and thank you again for stopping by. So funny! Boys (young men) are quite resilient when it comes to sleeping arrangements and make do as long as the hot meals continue. The appropriated room was my daughter’s and she completely supports the transformation. Do it! And when you get lonely, you can climb into your comfy chair and read “Ferdinand” out loud! Love your “writing room!” Currently building our 3rd house – can’t wait to decorate mine! Thanks so much for the like. I look forward to exploring your blog. Be well. Thank you for the kind words. I commend your ability to muster the energy to build your 3rd home – can’t wait to follow the progress on your blog! Yep, every woman needs a room of her own! Yours is perfect! Thank you so much! It’s no Ashford Castle, but it’s perfect for my peasant needs. Your piece about the castle was lovely and made me want to return to Ireland NOW. I should post a picture of my office! No Ashford Castle there either! Ha! Your post was so lovely I had to share it on my Open Suitcase Facebook page…in keeping with the season! I love your room and I’m so jealous… My son is only 7 months old and I’m already looking forward to the day when I can take his room back and make it my own! Word of advice from the other side of the parenting hill? 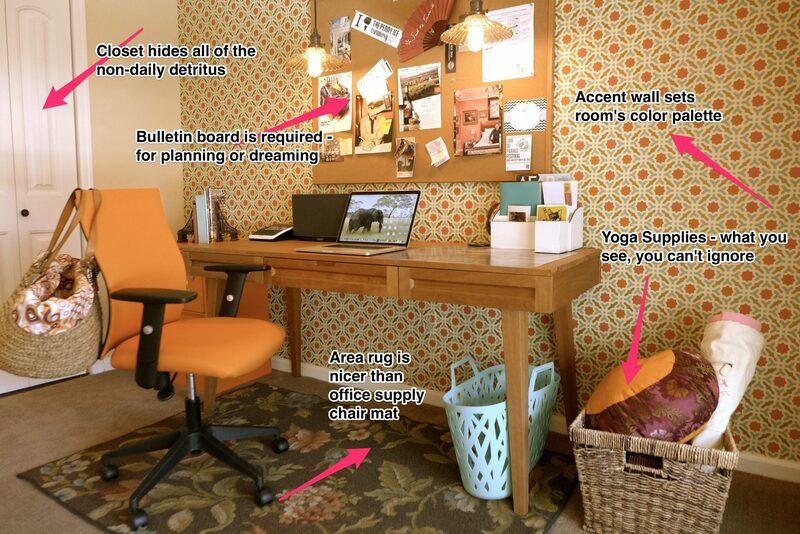 Carve out your own space now…a nook, niche or closet will suffice. Before too long, there will be large, plastic toys all over your entire house. Stake your claim before it’s too late!